Short and sweet project recap today! Oh, and also--I so appreciate the thoughts you left on Friday's post about my current home decor questions and style indecision... and about houseplants!! Half success, half not so much on those fronts... I haven't had any epiphanies about some of my decorating dilemmas, but I do have a much better sense of where to put which plants and how often to water them--after some advice from a sweet and helpful friend, who also gave me some little plants starts to pot and grow. Anyway, I had this boring white lampshade that I'd picked up at Goodwill a while ago--lampshades are so expensive, so even though I didn't have an immediate use for it, I bought it. So FQS sent me the nice cobblestone print, and I just recovered it! Which was almost as easy as I was expecting it would be. 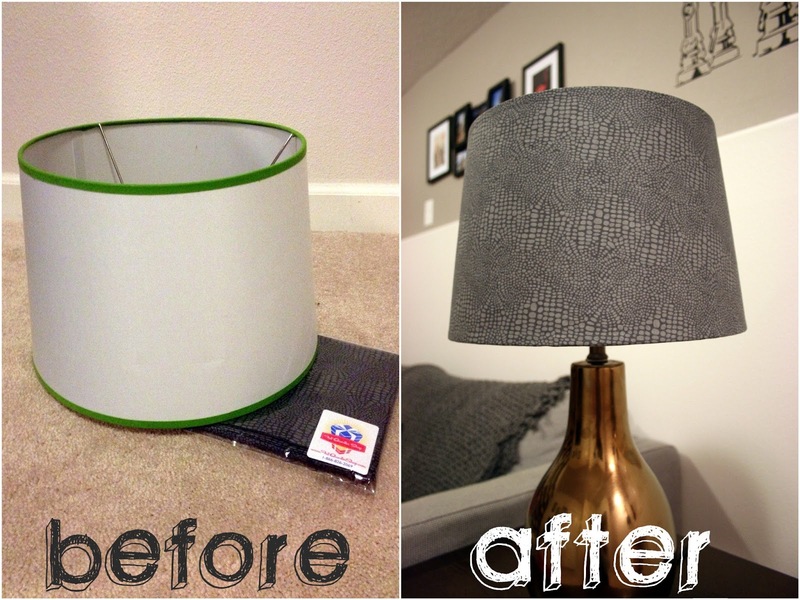 I definitely Googled "how to recover a lampshade" just in case. I used the existing lampshade as a pattern and rolled it on the fabric to get the right shape, then cut it out with an inch or so on all sides just in case. I gave the fabric a light allover coat of spray adhesive, then smoothed it back on. Then turned the edge under and sealed it with hot glue. Sooo easy! 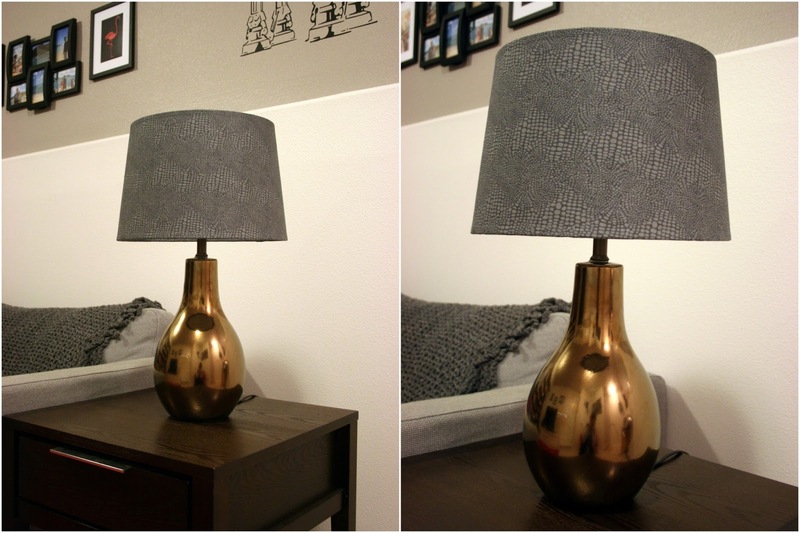 I put it on this copper lamp I also picked up on a whim at Goodwill. I'm not sure it's the best combination, but it works for now in the basement bonus room. The grey is nearly perfect with the other greys we have down there, but it's nice to add some texture with the pattern as opposed to some of the masculine lines that have ended up there with the TV, entertainment unit, bookshelves... here it is for now. Always nice to have a win over the weekend! Verdict: lampshade-recovering: easy. But how many recovered lampshades could I ever want?? I'm set with one for now. It still lights fine, although I guess it may not be the most energy-efficient shade! ;) Great for the bonus room, though! Cute! I like the print. I can see how maybe the darkness of the lamp and shade doesn't work the best. Maybe a white base? That looks amazing, thinking this maybe my next DIY!! I really need to be more creative when it comes to vamping up goodwill finds! Love the print you chose, too. The lamp looks great. Very expensive looking.